In order to give ample notice to everyone, I thought I'd post a little earlier than the release time tonight to detail how we are going to go about this. There are now 22 sets available to members here on the forum, instead of the original 20. @todras and I are giving up our own reserved sets to make sure as many sets are available for members here to have a chance of purchasing. To ensure the sets are available to P&C members only, there will be no link posted publicly to the Squadron website or posted here. Instead - you need to send me @SchoolForAnts a private message here on the forum (that way I know you're a P&C member) - no earlier than 7:30pm AEDST tonight. The first 22 members who message me at or after 7:30pm will be provided with a purchase link/invoice from the Squadron Soap store to enable your purchase. Do not post here, or email me - needs to be via private message here on this forum. In your message you need to provide me with an email address for you - so I can send the invoice to you. You will be able to pay via PayPal, credit card etc. Also - I wasn't going to release "Red Lead" at the same time - BUT - because I'm less than a week away from releasing that soap, so that you can save on postage (I know it would piss me off if I bought a product then 2 days later they launched another one), I have a limited number (12) of "Red Lead" available tonight to members who purchase the "Australians All" set - just so you can save on postage costs. 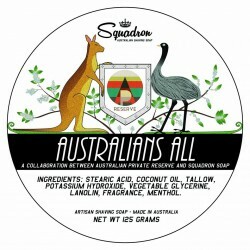 If you'd like a tub of "Red Lead" - Squadron Soap's Old Spice inspired soap, then also mention in your PM that you'd like a tub of that as well as the Australians All limited edition set. I'm out as I'm allergic to menthol. No rules like a minimum post count of 600? No rules, eggs...just soap and splash. So, have you sold out then? Hey @Sxot - I mentioned that it was 730pm AEDST in the top post, I was hoping everyone could work it out for their own timezone based on that. How? Where are you boys? Sorry, poor phrasing. I meant where are the forum members? I sent my PM at 7:30.03pm and I was afraid those 3 seconds would cost me! Alas I had to spend a fair amount of money on our enforced (missed flight) holiday so I'm missing out. No chance I could get that past wifebert, even using the asking for forgiveness method instead of the asking for approval one usually used. Yeah... It's a new low to be sure. But, if it had to be a pom, we're lucky its you. PM sent. Might be too late but oh well - gotta be in it to win it! Late to the party, but I am in! There are still a handful left - approx 6 sets by the look of it, so if you wanted a set but thought you were too late, come on down!